Women’s equal participation in climate change decision-making is fundamental to just policies that reflect and respond to the needs of the global community. 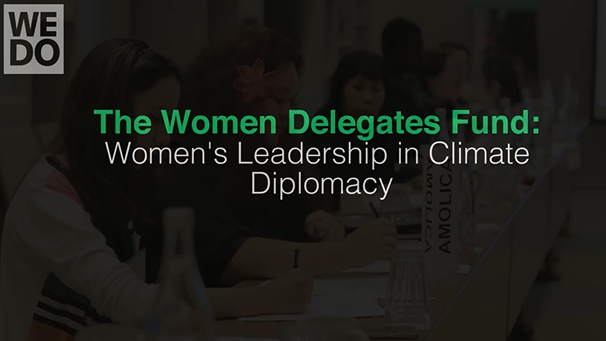 At the United Nations Framework Convention on Climate Change (UNFCCC), where negotiations will determine global climate policy, in 2015 women account for around 35% of all national Party delegates and around 26% of the Heads of Delegations. Research shows that gender imbalances differ across countries and regions. Women’s participation in Eastern and Western Europe, for example, is around 45%, while it is around 21% in Africa and the Asia-Pacific region. These differences can also be seen when looking at participation by UNFCCC negotiating blocks, with countries from the African Group, Least Developed Countries (LDCs) and OPEC having less representation of women on national delegations. Women’s equal participation in climate change decision-making is fundamental to just policies that reflect and respond to the needs of the global community. Recognizing a need to support the participation and leadership of women in the UN climate negotiations, particularly from countries most affected by climate change, in 2009, the Government of Finland partnered with WEDO, UNDP and IUCN to form the Global Gender and Climate Alliance (GGCA) and launch the Women Delegates Fund (WDF). The programme would be administered by WEDO. Since 2009 the Fund has received support from the Government of Iceland, and the Netherlands. In 2016, WEDO was proud to formalize an agreement with the Government of the Netherlands to provide support for the WDF for the next 5 years (2016-2020), as countries work to design the rules and modalities to implement the Paris Agreement. First and foremost, the WDF works to address a gap in women’s participation, particularly focusing support toward LDCs that have already limited capacity and resources to attend and effectively participate in the climate negotiations. While recognizing that this kind of travel support cannot be used as the only means to address structural gender inequality in decision-making at the regional and national levels, it is an important equity measure to support women’s full and effective participation, which can also lead to greater awareness raising and more inclusive policy decisions. In tandem with travel resources, the WDF prioritizes building leadership skills through knowledge and capacity building on technical issues related to the negotiations, including running mock sessions and practice in drafting interventions. Since 2012, the WDF has worked to develop comprehensive and sustained negotiation skills “modules”, including the institutionalization of a “Night School” (so named so because it is held in the evenings) during key preparatory and negotiating meetings. A final and critical element of the WDF is via advocacy, in particular by facilitating organizations and by the delegates themselves, to highlight the importance of innovative strategies to enhance women’s leadership, and provide a platform for wider discussion on women’s leadership in decision-making, as well as to promote policy change at international and national levels. This is not a program aimed only at bringing women to the table, but in creating a step-change in the power dynamics of the UN climate negotiations, and in all relevant bodies, towards one which encompasses women and men’s equal right to participate in decision-making. “Our leadership reaches more than just here… we can go back home and translate what is happening at this level to those on the ground who are being directly impacted by climate change. We can serve as role models at all levels for the importance of women’s leadership and participation.” —Sieane Abdul Baki, WDF Delegate since 2009, now Deputy Minister of Gender in Liberia. Since 2009, the WDF has supported 218 trips for 54 women across 40 countries to attend 25 sessions of the UNFCCC. Among these, over 40% of funded delegates were the only women on their national delegations. During these sessions, 9 ‘Night Schools’ have been held and a further 270 women have been trained in technical language and negotiations skills. There is progress to note: in the last 7 years, there has been a steady increase in women’s participation in the process, both in overall participation and at the highest levels of decision-making. The numbers of total women delegates has increased from 31% to 35% in this time frame, and women Heads of Delegation has risen from 16% to 26%. This progress can be attributed to various factors: the adoption of decisions promoting women’s participation in climate change mitigation and adaptation efforts at the UNFCCC, the implementation of gender quotas and the introduction of climate change and gender plans at the national level, as well as the introduction of initiatives such as the WDF to enhance women’s leadership in climate change negotiations and broader awareness raising efforts.